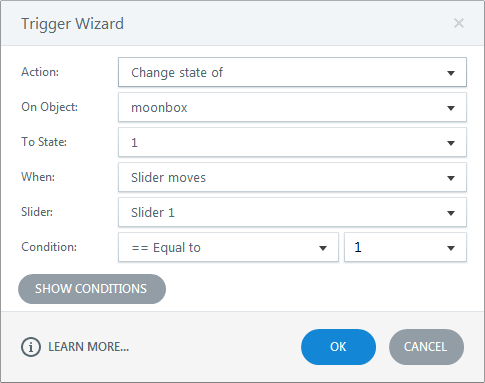 Slider interactions make it easy for your learners to manipulate data, explore cause-and-effect relationships, control objects and navigation, and more. In this tutorial, you'll learn how to add and customize sliders in Articulate Storyline 2. Download these practice files. Watch this video, then follow the steps below to practice. Position the slider toward the bottom of the slide. Insert an illustrated character, then size and crop the character so your slide looks similar to the one shown below. Add a trigger to change the state of the character to Angry when the slider equals 1. Select the rectangle shape and go to the States panel. Change the initial state of the moonbox object to 5 (Full Moon). Size and format the slider track and thumb elements however you like.